MB Model SHT- 25" dia. 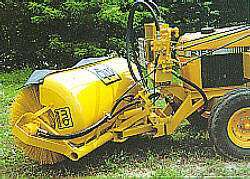 Brush, Includes independent hydraulic system (7ft)Front Mounted Hydraulic Drive Windrow Type Single motor -25 inch diameter brush Includes independent hydraulic system Mounts to tractor frame. Consult factory for available applications. A PTO driven independent hydraulic system is provided as standard. Hydraulic tank and all necessary hoses are included. Location of pump is dependent upon application. Consult factory. Hydraulic valve(s) are electric type, requiring installation of switch(es) at the operator's position. In most applications, brush on/off is operated by electric valve. In some cases, brush on/off is operated by tractor PTO. Brush is driven by single hydraulic motor coupled directly to the core by a splined shaft. 25 inch diameter sectional brush, with choice of polypropylene, wire or combination radial segments. Hydraulic angle change 30 degrees right and left is standard. For most applications, a brush lift mechanism with cylinder is provided, controlled by electric valve. Consult factory. Estimated shipping weight: 850 lbs (5 ft), 900 lbs (6 ft), 950 lbs (7 ft).